This topic contains 3 replies, has 3 voices, and was last updated by shenyongo 1 year, 3 months ago. Disney is growing even bigger than ever before and not even we can stop it. Disney CEO Bob Iger isn’t leaving Disney in July 2019, as originally planned. His contract has been extended through the end of 2021. Rupert Murdoch, the executive chairman of 21st Century Fox, and Disney’s board of directors both asked Iger to stay. In terms of scale, the Fox acquisition dwarfs the previous ones that Iger made for Pixar, Marvel, and Lucasfilm. Disney shelled out just under $16 billion for those three companies combined. While the Fox deal is worth $52.4 billion, Disney is also taking on $13.7 billion of 21st Century Fox’s net debt, making the total transaction value worth $66.1 billion. Disney now owns the film rights to Avatar, X-Men, Fantastic Four, Deadpool, The Grand Budapest Hotel, Hidden Figures, Gone Girl, Planet of the Apes, Ice Age, The Shape of Water, and The Martian, as well as tv rights to This Is Us, Modern Family, The Simpsons, Family Guy, The Americans, and dozens of other shows. They also acquired FX Networks, National Geographic Partners, Fox Sports Regional Networks, Fox Networks Group International, Star India, and Fox’s interests in Hulu, Sky plc, Tata Sky, and Endemol Shine Group. 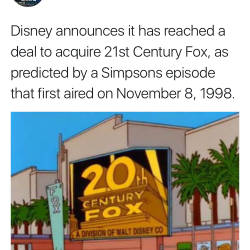 The Simpsons team released the image below to commemorate being acquired by Disney. Specifically related to animation, Disney now owns Fox Animation and Blue Sky Studios. Is three feature animation studios too many or will Disney hang on to Blue Sky in addition to Disney and Pixar? Also important to note that Fox Animation was in a state of expansion, and recently signed a deal with the U.K.’s Locksmith Animation to create a second pipeline for animated films, in addition to Blue Sky. What’s going to happen to all these films? It’s a waiting game at this point. Disney did not acquire Fox Broadcasting network and stations, Fox News Channel, Fox Business Network, FS1, FS2, and the Big Ten Network. 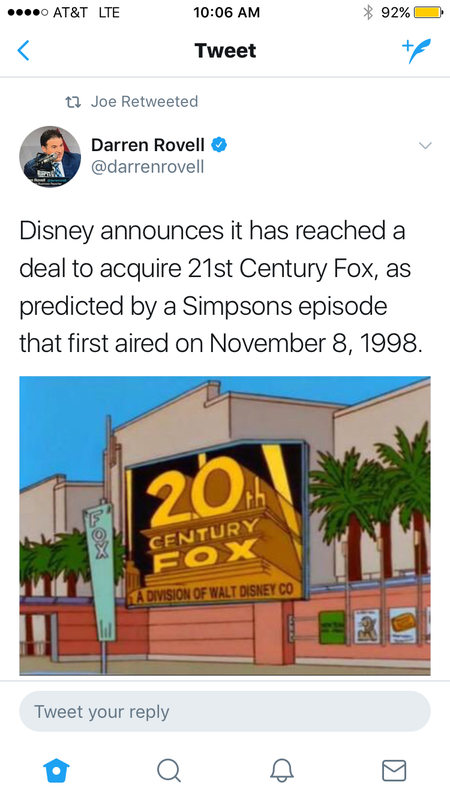 21st Century Fox will separate those assets into a newly listed company that will be spun off to its shareholders. Disney, which previously owned 30% of the streaming service Hulu also bought Fox’s 30% share, giving them a majority stake in the service. The other owners include Comcast and Time Warner. Disney is now a serious player in online video. “We are not really looking to necessarily reach the scale of Netflix quickly,” Iger said this morning on Good Morning America which airs on Disney-owned ABC, “but we certainly aim to be an able competitor to theirs.” Disney has already announced that they will launch multiple streaming services in 2019. Disney’s international reach significantly expands with the acquisition of Sky, Fox Networks International, and Star. Sky serves nearly 23 million households in the U.K., Ireland, Germany, Austria, and Italy; Fox Networks International has more than 350 channels in 170 countries; and Star India operates 69 channels reaching 720 million viewers a month across India and more than 100 other countries. The deal still has to pass U.S. regulatory hurdles, which as Variety points out, will be a complicated process.